). The two-day conference will provide delegates with the unrivalled learning opportunity of hearing from internationally renowned experts providing their vast expertise and experiences in the ever-evolving field of RNA therapeutics. This year’s Chair has been announced as Ekkehard Leberer, Senior Director at Sanofi-Aventis Deutschland GmbH, who will be opening and closing the conference, as well as giving a presentation of his own on day two. Dr Leberer is currently responsible for R&D Alliance Management at Sanofi, and is the Scientific Managing Director of the Innovative Medicine Initiative COMPACT Consortium on the delivery of biopharmaceuticals across biological barriers and cellular membranes. He joined Hoechst Marion Roussel in 1998 and carried out various managing roles there, in Sanofi’s predecessor companies and Sanofi itself, and has also served as Head of Biotechnology Germany and a member of the Scientific Review Committee of Aventis Pharma Germany. Dr Leberer also served as Senior Research Officer in genetics and genomics at the Biotechnology Research Institute, National Research Council of Canada. His research focused on the molecular mechanisms of signal transduction and the role of signalling molecules in human diseases. He is also the principal discoverer of the p21 activated protein kinase family of cell signalling proteins and of novel virulence-inducing genes in pathogenic fungi. “I am Ekkehard Leberer, Senior Director of Alliance Management at Sanofi-Aventis Deutschland GmbH. 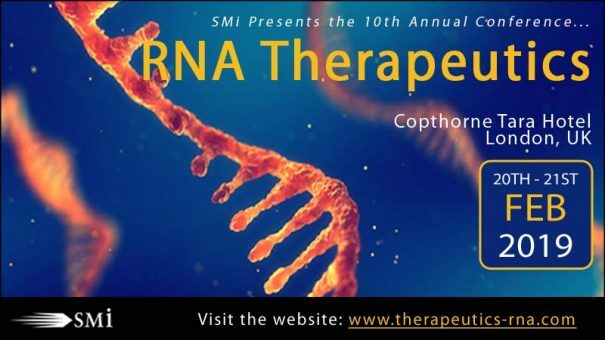 I am delighted to be Chairing the first day of SMi’s 10th annual RNA therapeutics conference in February in London. This year brings together industry experts from leading RNA therapeutics companies to discuss the challenges for clinical translation of RNA-based therapeutics, with an emphasis on recent advances in delivery technologies, and present an overview of the applications of RNA-based drugs for modulation of gene and protein expression, and genome editing. The event will build an understanding of innovations across the field and their potential impact on the field.